As we towed Gemma over the bridge that spans Westport Harbor, the water in all directions was glassy calm. The only ripples anywhere were from the buoys leaning into the strong ebb tide. We were late for the light northerly that diminished to a flat calm on this sunny January day. At the last minute, rigging Gemma at the shop, we undertook one too many final adjustment projects: replacing the bracing struts on the mast tabernacle, mounting a turning block on deck for the main halyard, devising fair leads for the dual snotters on the main sail, mounting cleats for the mizzen halyard and topping lift, fussing with the downhaul arrangements for both sails. After clearing the frozen seaweed from the ramp we stepped the masts, raised the mizzen, and took a deep breath. Small ice floes drifted by in the tide. As all boats do when they approach the sea, Gemma looked smaller. The masts, which seemed so over-sized in the shop, now looked skinny. Since Gemma is an improvised boat, we improvised a drink for the re-christening; hot milk with honey and rosemary infused vodka. I had no problem tossing most of my grog on her cutwater, “ I re-christen you Gemma of Marsh and Bay Expeditions! We aren’t trying to help the world and we aren’t trying to screw it up; we’re just launching a cat-ketch daysailer” A breath of SW breeze wafted by and Gemma’s mizzen cocked a little to the NE as she slid into the space between the piers. Afloat, John sheeted in her mizzen and watched as Gemma backed herself slowly over to the dock. Our first use of the mizzen for maneuvering in a tight space worked. 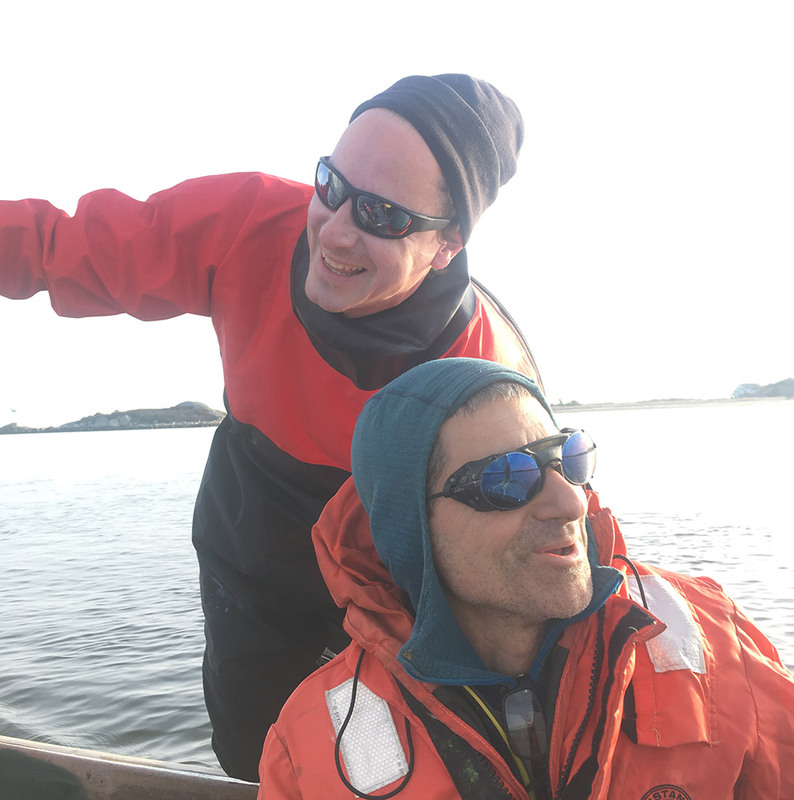 I jumped aboard and prepared to row out between the piers, but as we got away from the shore the breath of wind filled her sails and Gemma lazily took to sailing. A large chunk of ice growled along our windward waterline. Out in the current we picked up more apparent wind and 2-3 knots of actual wind. Heeled a bit, the full battens fell to leeward into the air that slipped around the main mast. Now we steered carefully to avoid the ice. The mizzen, eased slightly, provided a neutral helm. On a wishbone sprit boom, foot and leach tension are controlled by two snotters (port and stbd.) that lead down from the forward corners of the boom to the deck and then lead back to the cockpit. Tension on the snotters causes the boom to push aft and tension the sail. The angle of the boom (it is suspended forward by “lifts” that hang from the mast, and aft by a normal topping lift) determines the ratio of tension between the leach and the foot. In addition, the snotters can be criss-crossed so that tension on the windward snotter pulls the boom to leeward, allowing more space for the belly of the sail on its leeward side. This system is a bit of a contraption for the unaccustomed, but really no more complicated than the boom vangs, kicking straps, highfield levers and etc. Well, the snotters worked almost perfectly, allowing the shape of the sail to be fine tuned for the point of sail and wind speed. And the added advantage of this system is that the main sheet doesn’t have to provide the vanging force for the leach of the sail, so with the two functions separated, the sheet can be fewer parts and the vang tension can be controlled independently of the sheeting angle. On our first jibe, the aft end of the main boom caught on the mizzen snotters. Good thing only 3 knots of wind! Other details and critiques illuminated themselves. A pull in the main (and mizzen) suggests we may need more roach support. We like having dual mizzen sheets (so the mizzen can be sheeted flat, but want clam cleats for mizzen sheet adjustments. Do the sails need windows? It doesn’t seem so; the space under the upward sloping foot of the main gives a good view of the water ahead. And the steep angle of the boom makes the cockpit welcoming and safe. The angled wishbone boom provides a nice railing for walking on deck, and once up front, the “brow” of the boom is a handhold just above head-height. We like the mast hoops (made out of PEX tubing) and the jacklines. When the sheet is eased the sail goes out without changing shape, and the battens flop to leeward opening up the luff just beside the mast; and when the halyard is let go the sail zooms down the mast. We like adjusting the luff tension at the downhaul with the halyard two-blocked. We like it so much we think the downhaul deserves to be led through a turning block and aft to the edge of the cockpit where the halyard and the snotters are made off. And we like the empty cockpit with just a couple thwarts– ample room to sit but also easy to stand up and move around. This is a problem, since the plan calls for extensive longitudinal thwarts for sleeping berths. So we are rethinking the cockpit layout. Of course, we argue on about reserve buoyancy, having demo-ed the legacy thwarts with their entrained (waterlogged) foam. We agree that before its official commissioning the boat will have full reserve buoyancy. The almost imperceptible SW breeze miraculously held, but the sun was sinking fast. We picked up Emily and Lucia at boat beach and broad-reached up-current toward the docks. All parents marvel at the cleverness of their children. In Lucia’s case, I also marvel at her innocent wisdom. She steadfastly chose pink paint for Gemma. And Gemma’s re-construction spanned a year in which pink has suddenly become a powerful symbol of social justice, hopefully making the future into which Lucia sails better. How could anyone have guessed we’d be christening this pink boat on the day of the 2nd International Women’s March, thereby giving Westport Harbor a minor role in this momentous event. Landing a cat-ketch, whether dock, beach, or mooring, is a great pleasure. 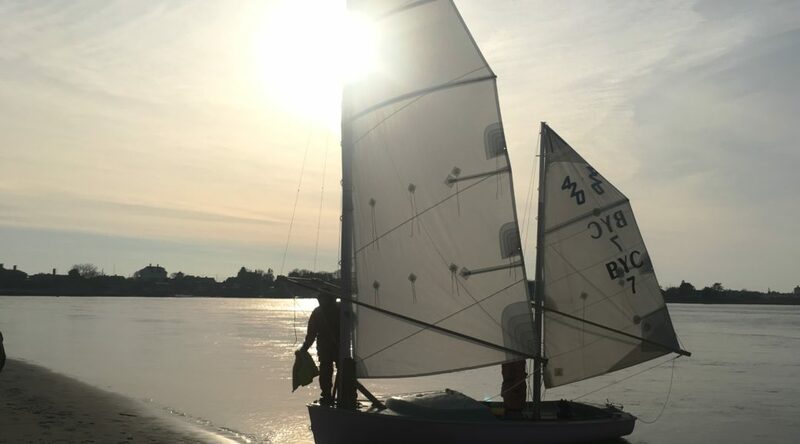 The main sheet can be let out until the sail has no power, and then sheeted in slightly to provide just enough gas to reach your parking place. The mizzen helps steer, even as flow past the rudder diminishes. In contrast, landing a sloop requires strategy and forethought. In all but an exact windward landing, the main sail can’t be let out enough to de-power it, and so some combination of “j” shaped landing and a quick dousing of the sail is required. Meanwhile, carrying the jib up to the landing means having a flapping sail forward that someone needs to go tame while simultaneously tying up the boat. The night after christening Gemma I dreamed of sailing. In my dream I grew so accustomed to the easy landings in a cat-ketch that I forgot how to moor a sloop, and badly bungled a landing. 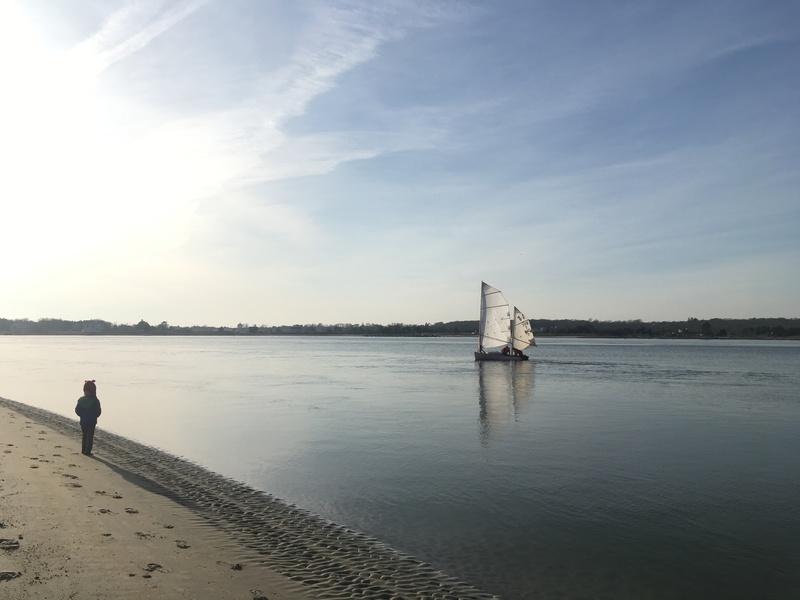 My dream was an omen of the danger of having a boat in our fleet that is so easy to sail: Our students will graduate in to a world of fractional sloops without knowing their idiosyncrasies. Marsh and Bay will continue its quest to build the ultimate coastal cruising dinghy. But we will have to remember that ordinary people cruise on sloops. Oddly, this is also the conundrum of parenting. We want our children to understand the way the world is, but we don’t want them to accept it as it is. We want them to understand the world and live in it happily, but nevertheless rise to the challenge of changing it for the better.